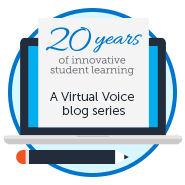 On my day off this week, I find myself eagerly drafting my first blog post for FLVS because (as all writers understand) I not only enjoy writing, I need to write. My own children were quite young when I started my career in early childhood education, but it was clear to me then (and even clearer now) that I am passionate about beautiful picture books and quality children’s literature. I whole-heartedly believe when those two are in alignment, we have the recipe to inspire our students to learn and fall in love with books. So how does “the joyous power of picture books” turn young listeners into readers and writers? Now I could write all the quotes from the experts on why young students need picture books incorporated into their curriculum, but instead will ask you to take a real break and give yourself a three-minute visual and auditory treat. Enjoy the art from the covers of beautiful picture books, listen to upbeat music, and read what world-renowned authors and illustrators have to say about the importance of offering their craft to your students. 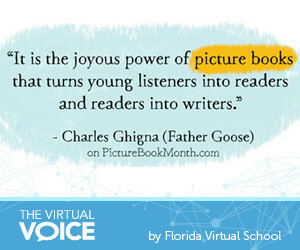 I invite you to explore all the rich resources on the website PictureBookMonth.com, where every day in November a picture book champion explains the importance of picture books. Just as the stars must be in alignment for the words and the art to complete one great picture book, the stars were in alignment for me when selecting Debi Ridpath Ohi’s captioned comic for this blog post. 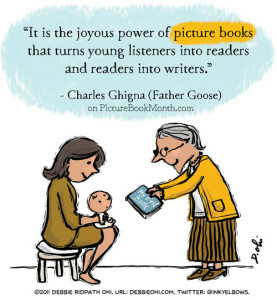 The Power of Picture Books by Fresh and Harkins (NCTE, September 2009). You can preview Chapter 1 here. 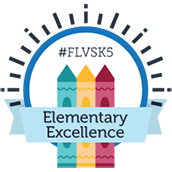 This entry was posted in Educator Edition, Homeschool Edition, Parent Edition and tagged Children's Books, Children's Illustrators, Creativity, Elementary, FLVS Elementary, FLVS Flex Elementary, Illustration, Literacy, Photo Book Month, Picture Books on November 13, 2015 by Guest Blogger. Nancy Jo- thank you for this awesome post about picture books. I look forward to encouraging teachers to use picture books and thank you for your beautiful reflections!! Can’t wait to hear more from you! !